It’s an ambitious goal: Westport wants to be “net zero” by 2050. By mid-century we hope to produce or purchase as much renewable energy as we use; minimize energy use in the first place through efficiency measures, and handle our water and waste in sustainable, resilient ways. Westport’s Green Task Force leads the charge. It’s a local response to a global problem. That approach fits perfectly with the life Peter Boyd leads. 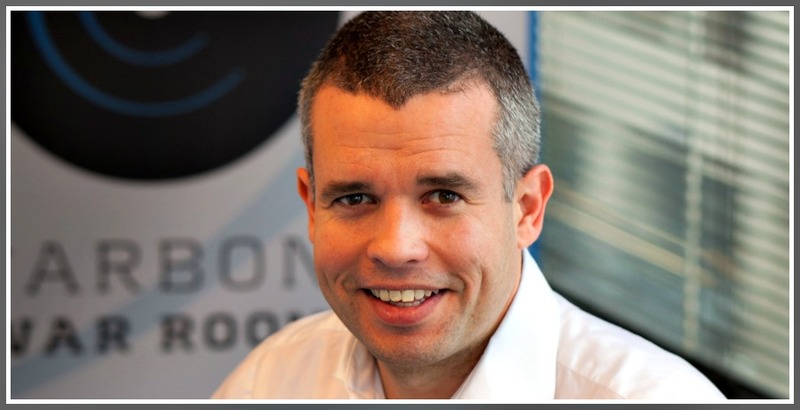 Formerly the COO of the Carbon War Room — helping businesses reduce carbon emissions at the gigaton scale — last fall Boyd advised a non-profit group of business leaders on their net-zero initiative leading up to the Paris Climate Conference. He just launched a consulting firm called Time4Good, and serves as an executive fellow at Yale’s Center for Business and the Environment. But he’s also a Scotsman who — after living in South Africa, London and Washington DC — moved to Westport 2 years ago, with his wife and 6-week-old baby. Almost immediately, Boyd joined the Green Task Force. Earthplace tapped him for its board of trustees. Boyd believes that local actions can have enormous impacts on our beleaguered planet. As he looks around Westport — his new home town — Boyd sees big houses, big cars, and people driving 50 yards down the road to meet their children’s buses (which stop less than every 50 yards). A fleet of them drove by after his recent Green Day talk at the Westport Library. “They’re better cars than what we have now, and they’re more fun to drive,” Boyd says. 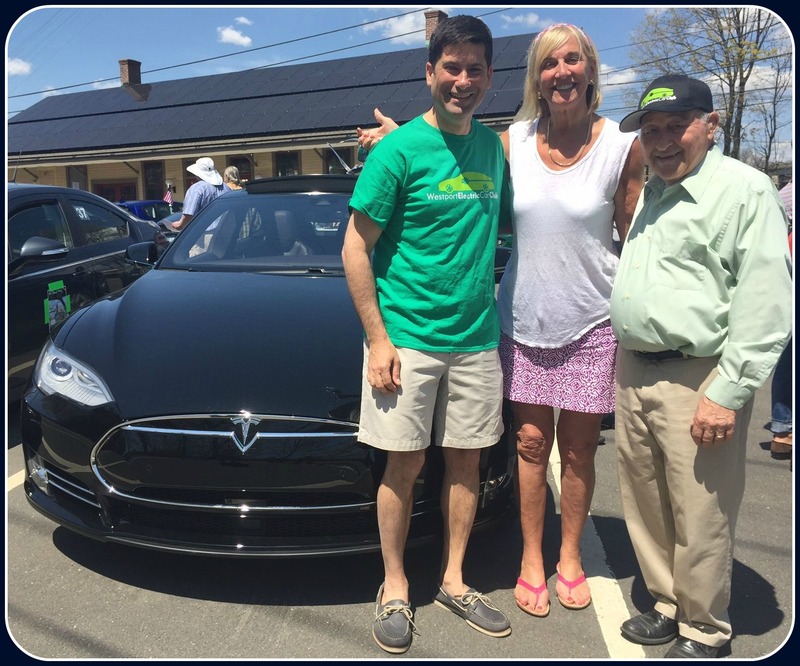 Robin Tauck (center) lent selectmen Jim Marpe and Avi Kaner (left) her 2 electric vehicles a while ago. Kaner liked driving it so much, he bought this Tesla P35D model. It goes from 0 to 60 in 3.1 seconds — not that anyone does that on local roads. On the right is Westport Electric Car Club president Leo Cirino. Another example: Boyd sees Westport homeowners install geothermal and solar systems. Their electric bills are “tiny,” he says — “and they’ve got clean, wonderful homes.” Weatherizing and insulating also pays enormous dividends. He stresses that NetZero 2050 is not about “moving to communal houses and taking all public transport.” Rather, it involves working at the town level, in personal ways. This entry was posted in Environment, Organizations, People and tagged Earthplace, Peter Boyd, Time4Good, Westport Green Task Force, Yale Center for Business and the Environment. Bookmark the permalink. I wish there was a way folks can be reminded to do one simple thing- stop idling in their cars. You see it constantly and it’s going to get worse as the summer temps rise. Many don’t realize its also against the law…. Peter Boyd and Pippa Bell Adair representing the Green Task Force made a presentation to the P&Z commission last year to bring us up to speed on net zero 2050. They will be working with us on the rewrite of the POCD. Interesting concept: save the environment via conspicuous consumption! Electric cars may possibly benefit the environment, but I doubt the lifestyles of people who buy c. $150,000 Teslas with the “Ludicrous Speed” option are environmentally friendly. These tend to be the folks with huge houses, and often several of them, all of which must be kept lit, heated/cooled, gardens irrigated — whether or not they’re occupied at the time. Wanted to apologize for being a little snarky here. I, too, think Teslas are cool, and maybe if I had the money I’d buy one. But I’d classify it more as a toy than a commitment to the environment.